This chapter introduces the primary treatises whose concepts and categories provide the “lens” through which the subject-text will be analyzed: the Kitāb al-Qiyās al-Sharʿī of Abū al-Ḥusayn al-Baṣrī, the Maʿūna fi’l-Jadal of Abū Isḥāq al-Shīrāzī, and the Minhāj fī Tartīb al-Ḥijāj of Abū al-Walīd al-Bājī (Sect. 4.1). In subsequent sections, their key concepts and categories are reviewed, with brief expositions on the various modes and hierarchies of epistemic justification (Sect. 4.2), representative typologies of qiyās (Sect. 4.3), modes of question and response (Sect. 4.4), categories of objection and critique (Sect. 4.5), and procedural norms and proper comportment in debate (Sect. 4.6). 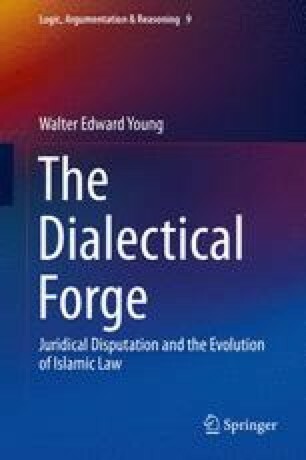 The chapter concludes with an overview of parallels and divergences between full-system jadal-theory and Aristotle’s dialectical method in the Topics and Sophistical Elenchi, following the illustration of a new developmental schema for Islamic dialectical traditions, emphasizing common origins, parallel development, and continuous cross-germination (Sect. 4.7).